Free-tailed bats (Family Molossidae) are so named because of a length of “free” tail projecting beyond the end of the uropatagium---the interfemoral membrane connecting the base of the tail with the legs. This gives free-tailed bats a degree of maneuverability matching their diurnal ecological avian equivalents: swifts, swallows, and martins. The Mexican free-tailed bat or the Brazilian free-tailed bat (Tadarida brasiliensis) is native to the Americas and is considered to be one of the most abundant mammals in North America. It roosts in staggering numbers at relatively few locations, so despite its abundance, it is vulnerable to habitat destruction. The Mexican free-tailed bat ranges from the southern half of the continental United States through most of Mexico, most of Central America and into South America and the Caribbean. The largest known colony is found at Bracken Cave near San Antonio, Texas with a population estimated at nearly 20 million bats. The Congress Avenue Bridge colony in Austin, Texas supports an estimated 1.5 million bats, and on the eastern edge of the Llano Estacado in the Clarity Tunnel in Caprock Canyons State Park, Texas there may be as many as 250-500 thousand bats. Carlsbad Caverns National Park, New Mexico once had Mexican free-tailed bats numbering in the millions, but now the population is drastically reduced due to pesticide exposure, especially to DDT and its metabolites. In Texas, there are two subspecies of the Mexican free-tailed bat: T. b. mexicana found over most of the state and is highly migratory and T. b. cynocephala, a non-migratory subspecies in the eastern quarter of the state. 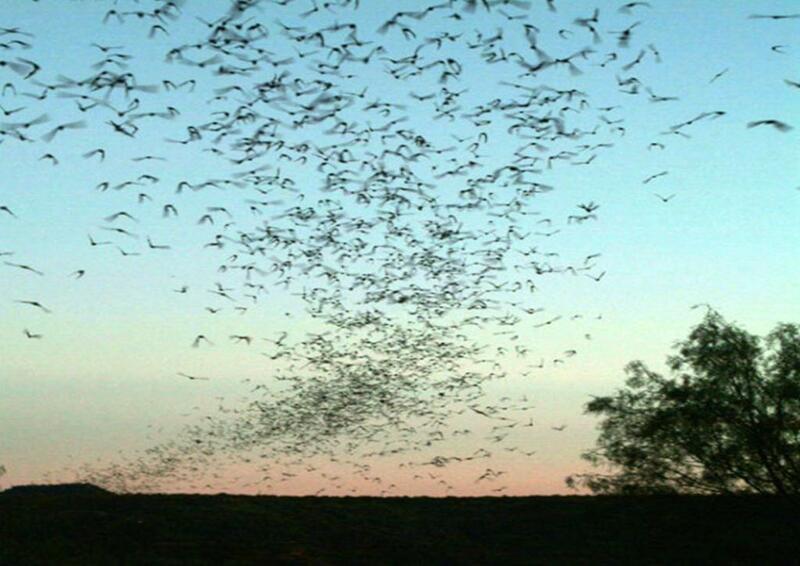 The presence of Mexican free-tailed bats is seasonal in most of Texas. Few overwinter in Texas guano caves because T. b. mexicana are inefficient hibernators spending winter from early December to late February in Mexico, Central America, and South America. During migration they will use rock fissures, crevices, bat houses and cliff swallow nests for roosting sites, but it is still not known where the majority of individuals of the large summer colonies spend winter. Mexican free-tailed bats are insectivores hunting their prey using echolocation. Enormous summer populations of bats nightly consume enormous quantities of insects---many of which are serious agricultural pests. Moths are the preferred items, but other types of insects like beetles, dragonflies, bugs, wasps, and flying ants are also consumed in flight. Mexican free-tailed bats are nocturnal foragers and begin feeding after dusk. They travel far (over 50 km) in rapid, direct flight. They also fly high (up to 3300 m) to feed on migrating insects. Their traveling echolocation calls are brief, but constant, but will change frequency when prey is detected. It has been discovered that their ultrasonic vocalizations have the effect of jamming the echolocation calls of rival bat species hunting moths. Nightly emerging bat flights are also anticipated by predators near the exit like hawks, owls, skunks, raccoons, and some snakes. During the breeding season, female Mexican free-tailed bats aggregate into maternity roosts, the size of which depending on the environment and available space. Females mature at 9 months and males at around 2 years. Females go into estrous one time a year lasting about 5 weeks in the spring. Both sexes are promiscuous breeders. (Most of the mating in the Texas population is accomplished each spring before the bats arrive at Texas caves). Male bats predominate caves for a brief period in the early spring, but are quickly outnumbered as the female population approaches parturition. It is also assumed that many males remain in the tropical and subtropical portions of their range. Gestation is between 11 and 12 weeks with a single pup being born. The pups are left hanging in a crèche while the mothers roost elsewhere. Mothers use vocalization and scent to identify their own pups. In guano caves, a pup may lose its grip on the ceiling and fall to the floor. If one falls, Dermestes beetles living in the accumulated guano will devour it. Eggs of the beetles are in the guano-covered cave floor for the winter. In the spring when the bats return, fresh bat droppings stimulate the eggs to hatch. Beetle larvae feed on fresh guano and any fallen bats during the summer. In the fall, when the bats leave, the adult beetles lay eggs and then die. 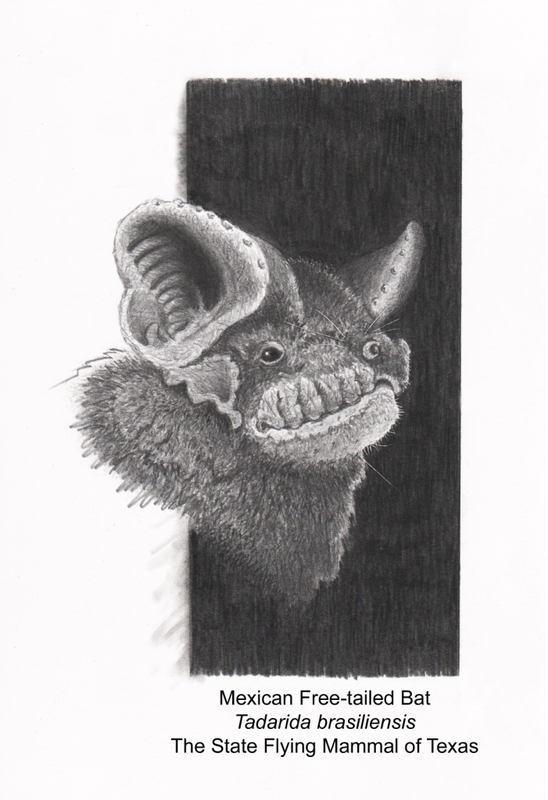 In late summer, increasing numbers of flying bats is the result from mass achievement of fledgling status among the babies which contributes to overcrowding in the cave. Relief comes by the rapid disappearance of adults as the fledglings take flight…and perhaps the adults then migrate southward out of Texas. After late July, the fledglings predominate, remaining at their birth cave until the cooler weather arrives in October and November.